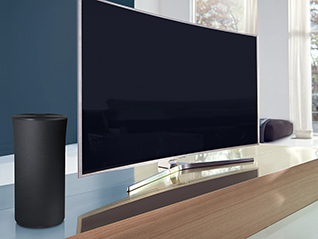 Suitable for use in small-to-medium rooms, the dark gray Samsung Radiant360 R1 Wireless Speaker offers a spacious, 360 soundfield. 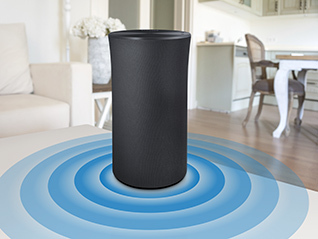 This omni-directional speaker features dual-band Wi-Fi and Bluetooth wireless connectivity, and can be controlled by the free Samsung Multiroom App 2.0 for iOS and Android devices. 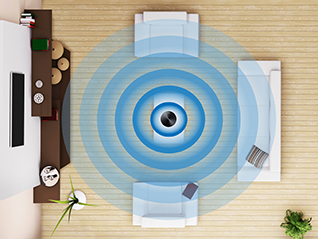 Once connected to your network, you can control your speakers from compatible smart devices. The Multiroom App 2.0 allows you to enjoy Internet radio sources and add additional Radiant360 R1 speakers for multi-room enjoyment. As opposed to conventional speakers, which transmit audio from one side of the speaker's cabinet, the Radiant360 features dual acoustic lenses that transmit audio from the speaker in a 360 direction in an effort to produce room-filling sound. Conventional speakers transmit sound from only one side of the device and need to be arranged for optimum sound projection. 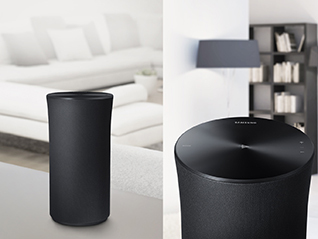 The Samsung R1 projects 360° omnidirectional sound, making anywhere in the room ideal for enjoying the perfect audio experience. Use the Multiroom App 2.0 to stream your favorite Internet music services. 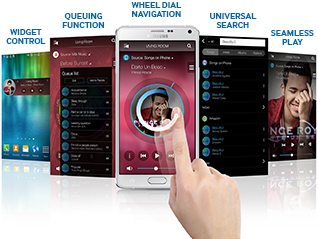 The intuitive interface features touch-wheel navigation for smooth song selection, direct play from the home screen, and fluid menu browsing. 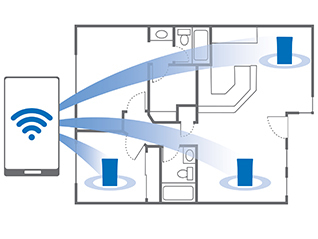 Use your mobile device and the free Multiroom app via Wi-Fi to connect and control one or multiple R1 speakers in any room of your home. The app is available for compatible Android and iOS devices. The intuitive top-panel interface of the R1 allows you to tap to control playback, swipe to play the next/previous track and toggle between play modes. 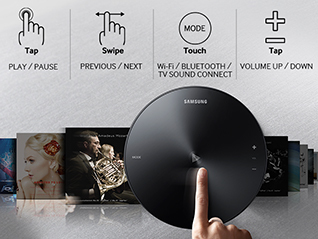 TV SoundConnect allows you to pair your R1 directly to your compatible Samsung TV via Bluetooth. 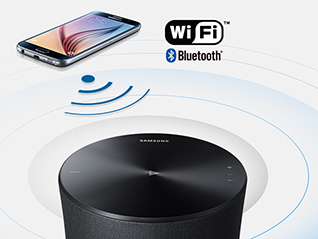 Use your mobile device to stream music wirelessly, connect up to ten R1 speakers over your home Wi-Fi network, or connect to a single speaker via Bluetooth. 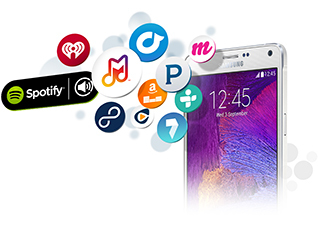 Simply launch the Multiroom App 2.0 on your mobile device and select from service providers such as Pandora, Spotify, TuneIn, Rhapsody, Amazon Music, iHeartRadio, Rdio, 8tracks, 7 Digital, Murfie, and Samsung Milk Music. Featuring a bold yet simple upright design, the R1 adds premium refinement to any space and is the perfect combination of function and design.